National Gift Card is the best place for you to order Fairmont Hotels Resorts gift cards in bulk. We are the experts in all things gift cards and can set up your gift card solutions program for you today. Please contact us for more information on Fairmont Hotels Resorts bulk, direct-to-recipient, or individual gift card fulfillment for your gift card program. Contact us here or call us at 888-472-8747 today! The Fairmont Hotels & Resorts gift card, physical and/or electronic format, is redeemable against any direct hotel charges managed by Fairmont Hotels & Resorts at time of redemption. 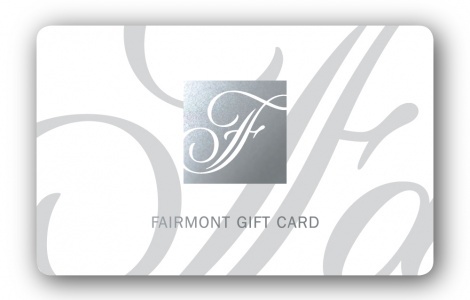 Fairmont Gift Cards are not accepted at Fairmont Heritage Place properties, with the exception of Franz Klammer Lodge and Ghirardelli Square. Fairmont Hotels & Resorts gift cards can also be redeemed at Fairmont Stores (retail locations and online), Fairmont owned and operated golf courses, Fairmont owned and operated food & beverage outlets, Fairmont owned and operated spas and any other outlet pertaining to Fairmont Hotels & Resorts. The Willow Stream gift card is redeemable for any Willow Stream Spa services or merchandise purchased at a Willow Stream Spa boutique. The Willow Stream gift card cannot be redeemed against any direct hotel charges managed by Fairmont Hotels & Resorts or at Fairmont Stores, Fairmont golf courses, Fairmont owned and operated food & beverage outlets or any other outlet pertaining to Fairmont Hotels & Resorts. Gift cards are available in Canadian and U.S. Dollars on our website. If redeemed at a hotel or resort where the local currency is other than Canadian or U.S. dollars, the gift card terminal will seek the current exchange rate powered by Oanda to calculate credit. The exchange rates used are based on current market conditions and cannot be adjusted by Fairmont Hotels & Resorts. The Fairmont Hotels & Resorts or Willow Stream gift card may be combined with other forms of payment. Guest charges in excess of the gift card's stored value may be settled with cash or major credit card. Not exchangeable for cash and has no value unless redeemed. Electronic gift cards are not exchangeable for physical gift cards.